By: Rev. Peter J. Arnoudt S.J. 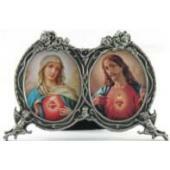 The Imitation of the Sacred Heart of Jesus. Recommended to us as even better than The Imitation of Christ, and we think it is! Written for everyone, and everyone should own it. In this book Jesus is speaking to the reader--through the author, of course--in short, easy-to-understand chapters that are filled with wisdom. Thereafter the student of the spiritual life--representing ourselves--speaks to Jesus. Renders a unique and powerful effect upon the soul! Impr. 734 pgs, PB No. 0149. "Then I saw the connection between the two Popes and the two temples. I am sorry that I have forgotten the numbers, but I was shown how weak the one had been in adherents and human support, but how strong in courage to overturn so many gods (I knew the number) and to unite so many different forms of worship into one; and, on the contrary, how strong in numbers and yet how irresolute in action was the other since, in authorizing the erection of false temples, he had allowed the only true God, the only true religion to be lost among so many false gods and false religions. It was also shown me that those pagans humbly adored gods other than themselves, and that they would have been willing to admit in all simplicity the only God, the Most Holy Trinity. Their worship was preferable to that of those who adore themselves in a thousand idols to the total exclusion of Our Lord. The picture was favorable to the early ages, for in them idolatry was on the decrease, while in our days it is just the contrary. I saw the fatal consequences of this counterfeit church; I saw it increase; I saw heretics of all kinds flocking to the city. I saw the ever-increasing tepidity of the clergy, the circle of darkness ever widening. And now the vision became more extended. I saw in all places Catholics oppressed, annoyed, restricted, and deprived of liberty, churches were closed, and great misery prevailed everywhere with war and bloodshed. I saw rude, ignorant people offering violent resistance, but this state of things lasted not long. Again I saw in vision St. Peter’s undermined according to a plan devised by the secret sect while, at the same time, it was damaged by storms; but it was delivered at the moment of greatest distress. Again I saw the Blessed Virgin extending her mantle over it."